One of the projects the post-doc has developed is to identify the genetic differences responsible for the very low competence of a clinical strain of H. influenzae. 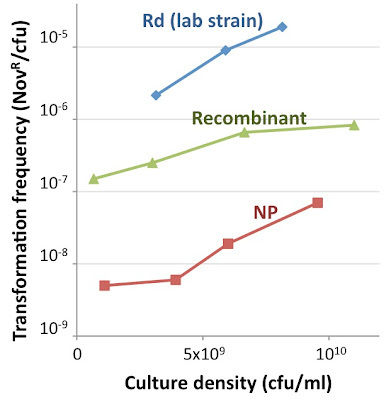 This strain (86-028NP, 'NP' for short) transforms 100-1000-fold less efficiently than the standard lab strain Rd after the standard competence-inducing treatments. To identify the genes responsible for this difference he transformed competent Rd cells with DNA from NP, and screened the recombinant cells for ones whose induced competence level had decreased (he had lots of help from a very diligent and competent undergraduate). (The strains they screened were the same strains whose genomes he sequenced to map their recombination tracts.) The undergraduate identified one strain whose competence was about tenfold lower than Rd's. Now I just want to confirm that the recombinant strain does have an intermediate phenotype, and, more generally, to carefully check the phenotypes of both parents and the recombinant, under all of the conditions we know that affect competence. So I want to check competence at all stages of culture growth in rich medium (a detailed time course) and after transfer to the starvation medium MIV. Below are the results of a simple time-course experiment using cells growing in rich medium. It's not a detailed time course since I only did 4 time points, so I plotted transformation frequency as a function of cell density rather than of time, but it clearly shows that the recombinant has an intermediate phenotype. Next I'll do a better time course and MIV-induced competence. I should also test induction of competence by transient shift to anaerobic culture, and by addition of cAMP to log-phase cells. As well as growing GFAJ-1 and making DNA I've been doing competence assays on Haemophilus influenzae strains. This is old-fashioned microbiology, and I seem to be the lab wizard at these assays (able to do them faster and more reproducibly than anyone else). She recently gave me a list of 12 mutants to test, preferably three replicates of each. I've now done two replicates of 6 of them (plus control wildtype cells), with the expected result that none could be transformed at all. If these results are concordant with earlier results using the marked mutants I don't think we need a third replicate. The knocked-out genes are pilA (the major type 4 pilin), pilC (pilus assembly protein), comC (pilO homolog, pilus assembly), comE (pilQ homolog; secretin pore), comN (pulG homolog, probable minor pilin), and comP (probable minor pilin). On Saturday I did the other 6 mutants, but I overreached myself, trying to do them along with another experiment (see below). I could tell at the time that it was hard to keep everything straight, and the results bear this out. Some plates that should have lots of colonies have none (I suspect that these were old plates that I forgot to supplement with fresh hemin), and even some of the replicate plates differ by ten-fold or more. The results for some of the strains are about what I expected, but I really don't trust any of the numbers and I think I need to do the whole lot at least twice more. These knocked out genes are HI0659 and HI0660 (cytoplasmic proteins with no known function), pilF2 (outer membrane, required for pilus assembly), dprA (cytoplasmic, protects DNA from degradation), HI1631 (location unknown; no known function), and comJ (cytoplasmic, no known function). 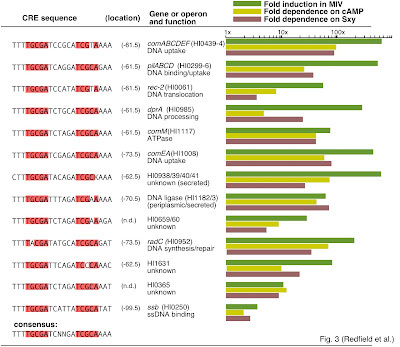 All but comJ are competence-induced genes in the CRP-S regulon. The other experiment I was doing on Saturday was a time course of competence development by three strains. I'll discuss this in the next post. OK, I finally have conditions where GFAJ-1 cells grow reproducibly in medium containing 40 mM sodium arsenate: tightly sealed screw-cap glass tubes or bottles, half-full, gently rocking at 37 °C. It's sadly true that I lack any insight into why the cells wouldn't grow in polypropylene screw-cap tubes, or in flasks, or why sometimes they wouldn't grow in anything. Since Wolfe-Simon et al. grew their GFAJ-1 in screw-capped glass tubes, I think I'm adequately replicating their growth conditions. So now I've grown big batches of cells in bottles and extracted DNA from them. My collaborators tell me they'd like to have about 50 µg of DNA for their cesium chloride gradient purification and mass spectrometry analysis. This requires starting with about 2 x 10^10 cells, given an estimated genome size of about 3.7 megabase pairs, and allowing for some losses in purification. For cells growing in phosphate-rich medium I figured 50 ml of culture would be enough (one with arsenate and one without), and for phosphate-limited cells I tried 500 ml. Harvesting the cells turned out to be a bit tricky, because when I centrifuged them they formed a very loose pellet - I had to take the pellet with about 10% of the supernatant and centrifuge again. I did only a crude DNA prep, by my standards, but the DNA is much cleaner than one sample in Fig. 2 of the Wolfe-Simon et al. paper. I lysed the cells with lysozyme and then 1% SDS, extracted them once with phenol and once with phenol::chloroform, and added NaCl to 150 mM and 2 volumes of 95% ethanol, all as Wolfe-Simon et al. did. But instead of centrifuging the now-insoluble DNA and RNA, I spooled the DNA fibers out onto the tip of a sealed glass pipette, rinsed them with 70% ethanol, and air-dried them. (I also added RNase A with the SDS to degrade the RNA.) Spooling can only be done with chromosomal DNA, because it requires long fragments at high concentration, but it's the method of choice because it leaves behind all the non-DNA insoluble material that centrifugation would pellet with the DNA. I then resuspended the DNA by swirling the in Tris-EDTA and gave the clumps time and pipetting to help the fibers disperse. I checked the concentrations using the wonderful NanoDrop spectrophotometer, and ran about 200 ng of each prep in an agarose gel to check its quality (length and cleanliness). 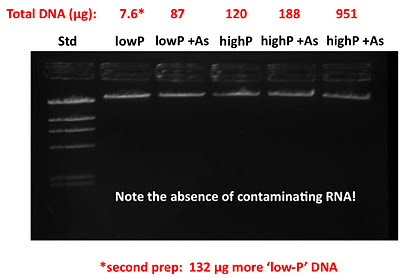 The gel photo below shows the results - clean preps of DNA fragments longer than 30 kb (the top size standard is the 27.5 kb HindIII fragment of Lambda DNA). I have almost a mg of the DNA in the rightmost lane. This was a separate prep - I hadn't yet discarded the high-phosphate plus arsenate cultures I'd done several days before (see Growth! ), so I just pooled them all, collected the cells, and did a parallel DNA prep. One problem with the cultures was that the phosphate-limited cells without arsenate looked very sickly when I harvested them, with orangish clumps of debris in the medium after two days growth and many misshapen cells seen under the microscope. And I only got 7.6 µg of DNA from this culture . So I inoculated a new culture, this time using 1000 ml divided between three bottles. Again the culture looked bad, but I was more careful in harvesting the cells, and would up with about 132 µg of DNA. So on Monday I'll send 50 µg of each DNA to my collaborators. The critical test will be assaying for arsenic in the DNA from cells grown with limiting phosphate and 40 mM arsenate, since this is the condition that was claimed to cause arsenic to be incorporated into DNA. I'm not sure how important the other culture conditions will turn out to be - if we detect no arsenate at all in this DNA, will we really need the other conditions to make our case? But if we do detect arsenic in this prep, these will be controls for background arsenic levels. The other odd think about my cultures was that the cells with 40 mM arsenate grew better than the cells without arsenate. This could just be an effect of ionic strength, since I put an equivalent volume of water in the no-arsenate cultures, so I'm going to do a careful dose-response curve with a wide range of arsenate concentrations, using NaCl to keep the ionic strength constant. Here are the results of my latest GFAJ-1 growth-in-arsenate experiment, for the cultures in glass tubes. 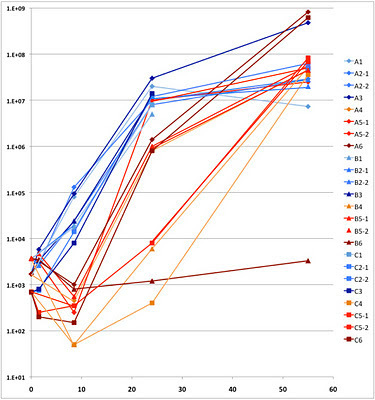 The blue lines and points are for cultures grown with no arsenate, and the red ones for cultures with 40 mM arsenate. 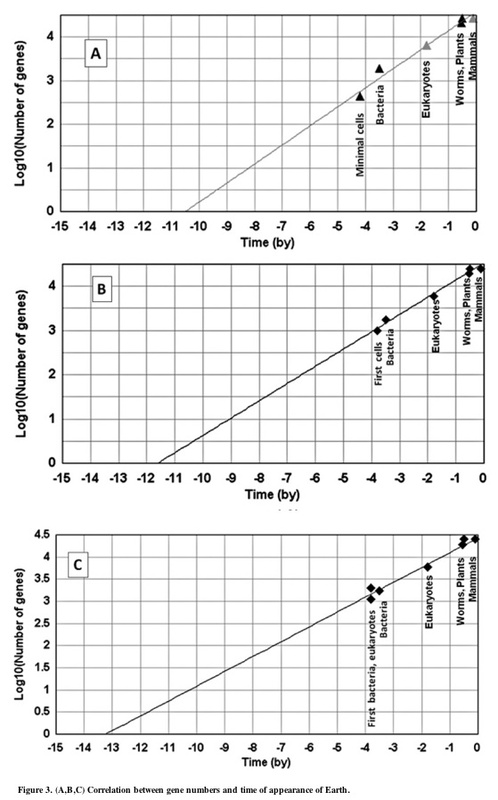 Oh, the X-axis is growth time in hours, and the Y-axis is cells/ml. One arsenate culture failed to grow, but the others all grew to the final densities I expected from the amounts of phosphate in the medium (light blue and light red, no added phosphate, medium blue and red, 3 µM phosphate, and dark blue and red, 1500 µM phosphate). 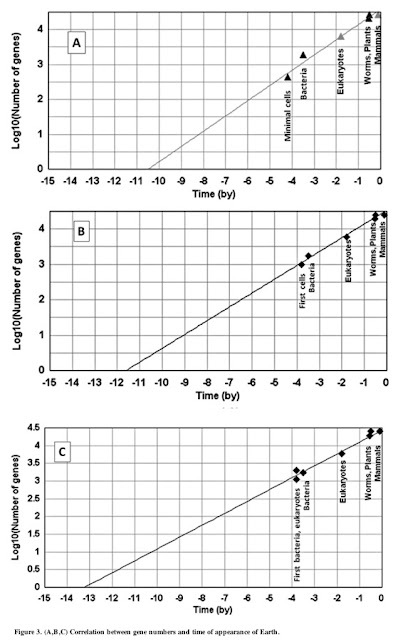 The most interesting result is that, although the no-arsenate cultures grew well right from the beginning, all the arsenate cultures had a ~ten-fold initial drop in cell density, after which they grew at about the same rates as the no-arsenate controls. The cells used as the inoculum were not pre-grown in arsenate medium, and this drop suggests that, although some of them can cope with the arsenate, many are dying. 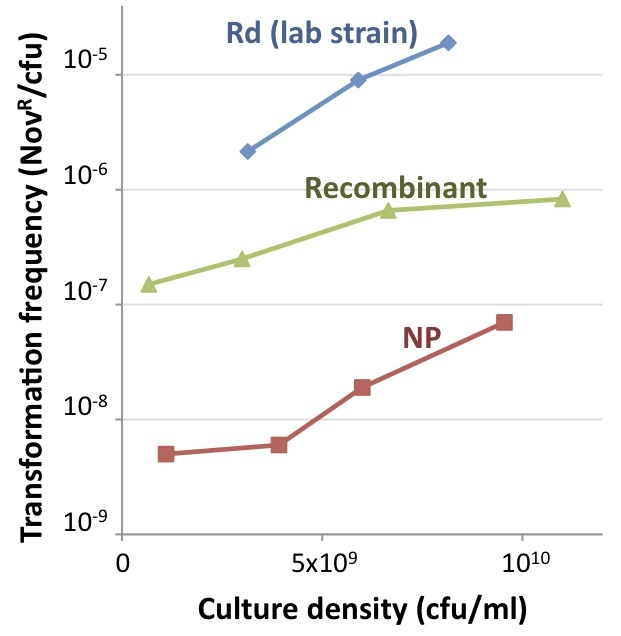 Inoculate cultures with larger densities of cells. I have been deliberately using small inocula (10^3-10^5 cells/ml) to ensure that the growth truly reflected the culture conditions (especially the limiting phosphate), but now I'm going to use about 10^6/ml. 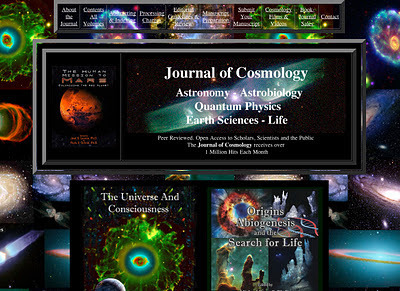 Remember the Journal of Cosmology? Earlier this year they published a paper by Richard Hoover that claimed to find microbial fossils in a meteorite. They splashed this claim all over the media, but I wasn't impressed. Nor was anyone else with any expertise. Well, they have a new treat for us. They've just put out a press release announcing a paper by Rhawn Joseph and N. Chandra Wickramasinghe, with the title Genetics Indicates Extra-terrestrial Origins for Life: The First Gene. Did life Begin Following the Big Bang? (scroll down past the flashy ads to see the text). 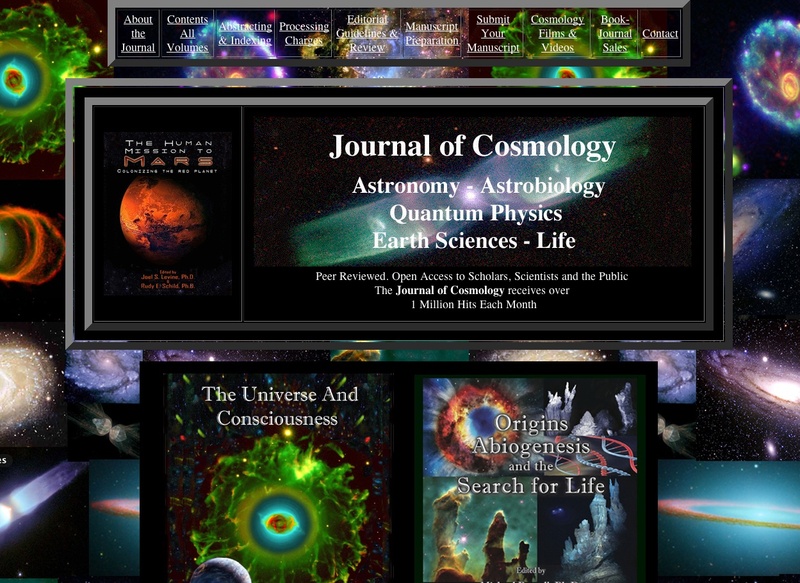 Here's the top of Dr. Joseph's web page. 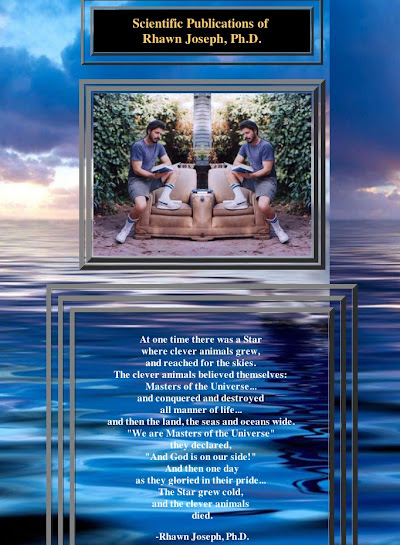 You really must click on it and scroll down, to see the full glory of his accomplishments (and read his poetry...). Be sure to also click on the link to his censored paper titled Sexual Consciousness: The Evolution of Breasts, Buttocks and the Big Brain. Wickramasinghe's bio is here; sadly it's not nearly as over-the-top as Joseph's. Yes, if you make the not-entirely-unreasonable assumption that the gene numbers typical of modern organisms were also typical of the first members of these clades, you can plot gene number as a function of time. Of course you can fit a line to these points, and if you also make the totally unreasonable assumption that changes in gene number have always been governed by a molecular clock, you can claim that this line shows the changes in gene number over time. You can extrapolate your line back to zero genes, and if you make the absurd assumption that this hypothetical gene-number clock applies before the origin of life on Earth, you can conclude that the first gene arose 10^10 - 10^13 years ago, close to the time of the Big Bang. I took cells from the glass-tube cultures and put them into (1, group on the left) glass tubes with arsenate medium from the pp tube cultures, (2, group in the middle) glass tubes with fresh arsenate medium, and (3, pp tubes with fresh arsenate medium). Thick growth in the glass tubes, even in the medium containing the corpses of cells that died when this medium was in plastic tubes. No growth in pp tubes. So the pp tubes don't cause some stable toxic change to the medium. 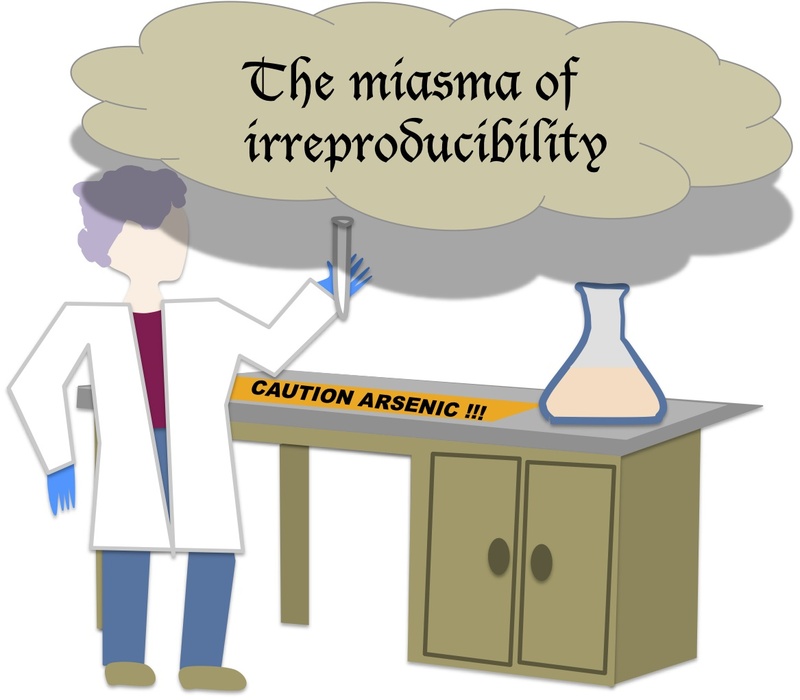 Teaching and traveling are over for a while, so I'm back at the bench, ready to grapple once more with the miasma of irreproducibility hanging over my GFAJ-1 growth experiments. I'm going to repeat an experiment I did in September, testing growth with different levels of arsenate and phosphate in plastic and glass screw-cap tubes. That time I only followed growth by changes in turbidity of the cultures, but this time I'll also follow the changes in the numbers of viable cells by plating samples on agar medium. I'll start the cultures tomorrow morning, plating the cells at t=0, so I know how many viable cells I started with, and again at t=1 hr, to see if cells are immediately dying in the arsenate. Then I'll plate at about 8 hr (after a family dinner, it being Sunday), and again the next morning. Should we be searching for cryptic uptake specificity? I was just reading the draft Discussion section of the post-doc's uptake-specificity manuscript, and realized that something we've only been casually mentioning may actually be a critical test of the hypothesis that uptake specificity is an adaptation to promote recombination. This test should certainly be included in our revised grant proposal. 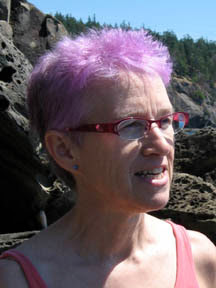 In bacteria of the family Pasteurellaceae and the genus Neisseria, the sequence bias of the DNA uptake machinery was discovered because the genomes of these bacteria contain many occurrences of the preferred motif, which causes these cells to preferentially take up DNA from their own and closely related species ('self' DNA). 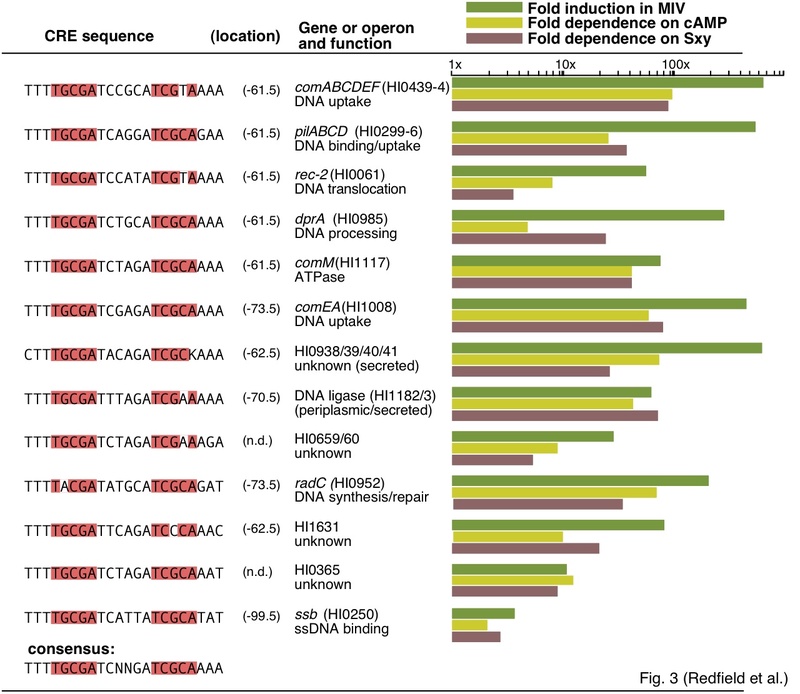 We think that the genomic uptake sequences have accumulated as an indirect consequence of the uptake bias, due to molecular drive arising from recombinational replacement of poor uptake sequences with better ones. Our computer simulation model shows that the strength of this drive depends on the strength of the bias, on the frequencies of DNA uptake and of recombination, and on the mutation rate. If the mutation rate is high, the bias must be strong and DNA uptake must be both frequent and frequently followed by recombination. A preference for self DNA has not been detected in most other bacterial species that can take up DNA*, and their genomes are not conspicuously enriched for anything that looks like an uptake sequence motif. However, although these species are usually considered to have unbiased uptake, this has not been explicitly tested. We are in an excellent position to test the Gram-negative species for uptake bias. The experiment would use a degenerate uptake fragment like that used for the post-doc's H. influenzae analysis, but the central sequence would be fully random. The cells would need to carry a rec2 mutation to prevent DNA degradation, but I think the presence of Illumina sequencing tags in the fragment means that we would not need to optimize (or even use?) the DNA recovery procedure. We'd just give the test fragment to competent cells, wash the cells thoroughly, and isolate and sequence the input and recovered DNA. Finding any uptake bias in a species whose genome is not enriched for the preferred motif would be strong evidence that the bias is mechanistic and has not been selected to promote recombination. This would be a very important result. * The exception are Campylobacter and Helicobacter; their genomes don't have recognizable uptake sequence motifs, and the uptake bias is hypothesized to depend on a DNA modification.